My best friend growing up was 100% Italian. We were inseparable so I often found myself staying over for dinner at her house. Her mom was an exceptional cook, but I noticed that the same simple salad was served at almost every meal. It consisted of undressed iceberg lettuce. That's it. Sometimes it would have some chopped up cheese, a few red onion rings, or a tomato in there but most nights it was just lettuce. 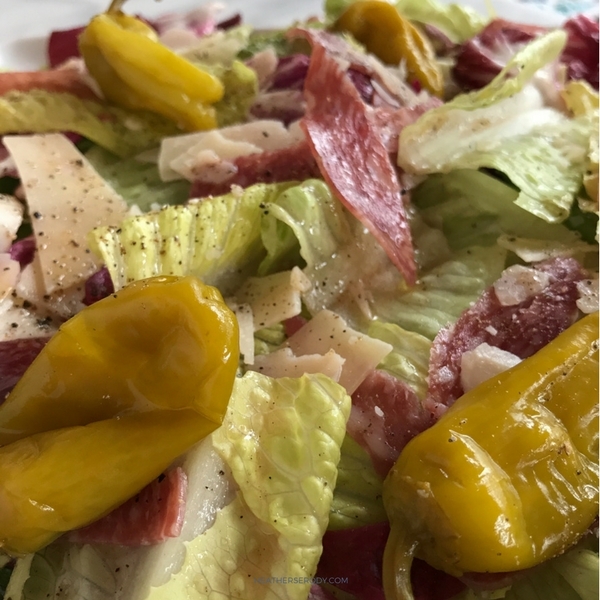 I was fascinated to watch her entire family drown their salad in olive oil and red wine vinegar and season it liberally with salt and pepper, like…more pepper than I ever had on any dish. So much so that there was a little pool of oil and vinegar at the bottom of each bowl when they were through. Once I finally tried dressing my salad their way I discovered it to be an explosion of salt and tang and crunch; so much so that I often found myself coughing my way through the meal from all of the vinegar & pepper, but I loved it. 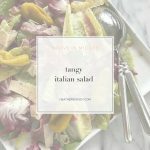 Ever since then, I always consider an authentic Italian salad to be simple. And tangy. For the dressing, I highly recommend you make it with more vinegar than olive oil, and season it liberally for a lip-smacking tangy burst of flavor. Whisk together dressing in a small bowl and season to taste. Combine lettuces together in a salad bowl & add half the dressing, tossing together to combine. Scatter optional add-ins on the top of the salad and serve immediately with the extra dressing.